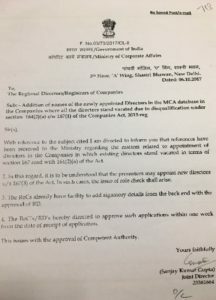 The Ministry of Corporate Affairs ( MCA ) notified the Companies (Registration Offices and Fees) Second Amendment Rules 2018 has been on 7th May 2018. 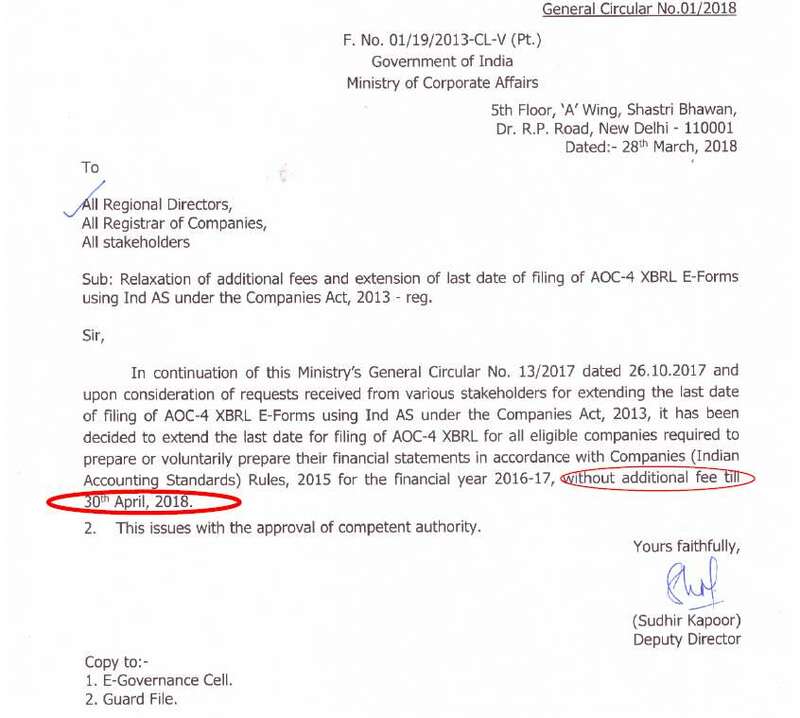 Due date of filings under Section 92 (Annual Return) or 137 (Annual Financial Statement) of the Companies Act, 2013 expires after 30/06/2018, the additional fee @Rs.100 per day shall become payable in respect of MGT-7, AoC-4, AoC-4 XBRL and AoC-4 CFS. 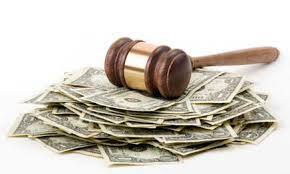 Other cases, where the belated annual returns or balance sheet/financial statement which were due to be filed whether under the Companies Act,1956 (23AC,23ACA,23AC XBRL,23ACA XBRL,20B,21A) or the Companies Act, 2013 (MGT-7, AoC-4, AoC-4 XBRL and AoC-4 CFS) additional fee as per the applicable slab for the period of delay up to 30th June 2018 plus @Rs.100 per day w.e.f 1st July 2018 shall become payable. 5TH FLOOR ‘A’ WING, SHASTRI BHAWAN, NEW DELHI. 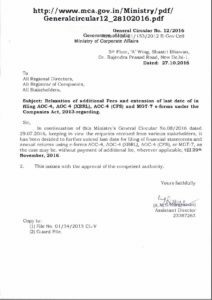 I AM DIRECTED IN INFORM YOU THAT REFERENCE HAVE BEEN RECEIVED IN THE MINISTRY REGARDING THE MATTERS RELATED TO APPOINTMENT OF DIRECTORS IN THE COMPANIES IN WHICH EXISTING DIRECTORS STAND VACATED IN TERMS OF SECTION 167 READ WITH 161(2)(A) OF THE ACT. 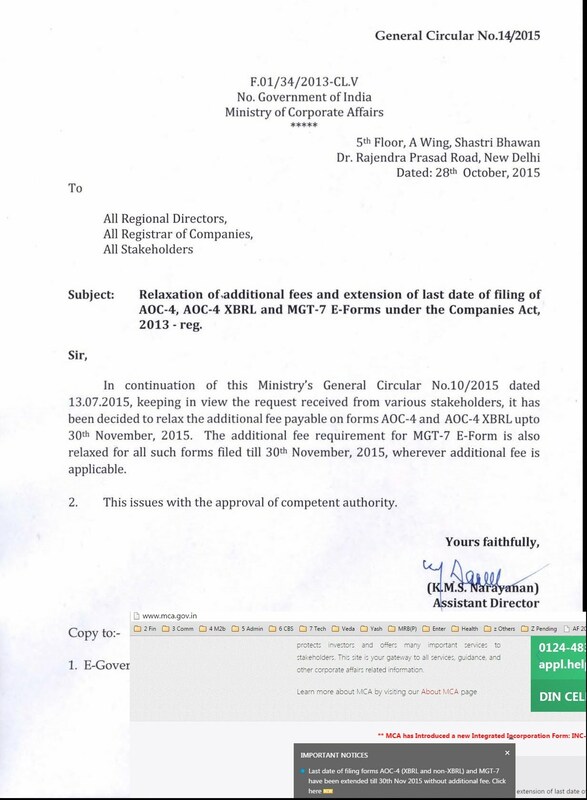 IN THIS REGARD, IT IS TO BE UNDERSTOOD THAT THE PROMOTERS MAY APPOINT NEW DIRECTORS U/S 167(3) OF THE ACT. IN SUCH CASES, THE ISSUE OF ROLE CHECK SHALL ARISE. THE ROCS ALREADY HAVE FACILITY TO ADD SIGNATORY DETAILS FROM THE BACK END WITH THE APPROVAL OF RD. 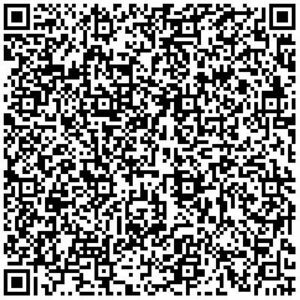 THE ROCS/RD’S HEREBY DIRECTED TO APPROVE SUCH APPLICATIONS WITHIN ONE WEEK FROM THE DATE OF RECEIPT OF APPLICATION. 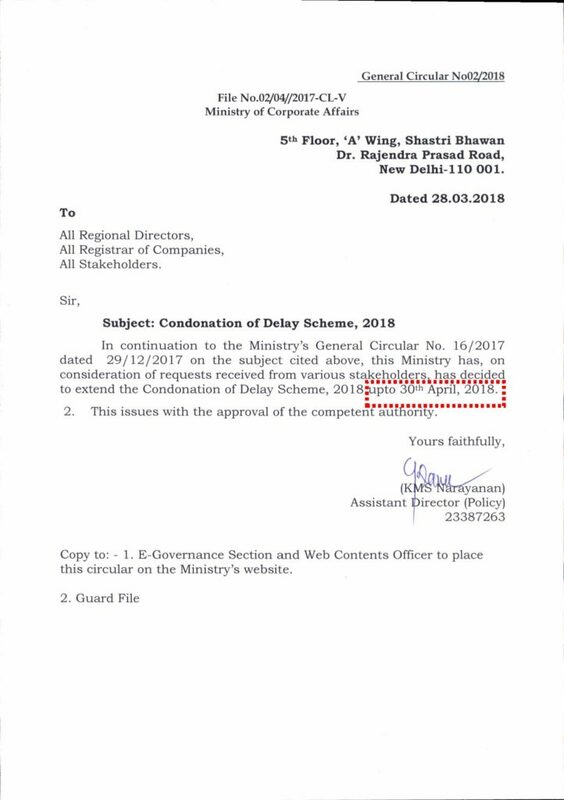 THIS ISSUES WITH THE APPROVAL OF COMPETENT AUTHORITY. 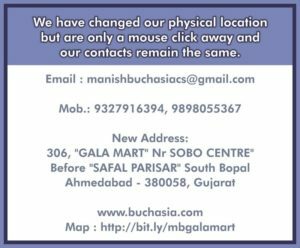 We have just changed our physical location but are only a mouse click away and our contacts remain the same.